Verizon has certified it for all bands, not just 13. James E1 and BigDinCA like this. Having received my phone yesterday, I'm happy to report that I have seen bands 2, 4, & 13 used this morning. I got it up and working. My data works and calls but no text. Any idea how to fix that? If you purchased the Unlocked model, does Advanced Calling, Wifi-Calling, and Video Calling work on VZW? Advanced calling, as in HD Voice, Yes. No on the video and WiFi calling as of now. Well thats a problem. I have no service at my house. I rely on WiFi calling. How's the signal on Verizon ? 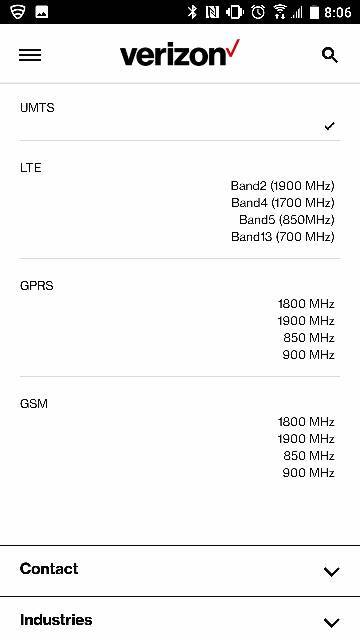 Does volte work ? Any issues with texting or anything ? Verizon VS996 - facebook chat head shading keyboard? Why is verizon so steep on disconnecting fees?